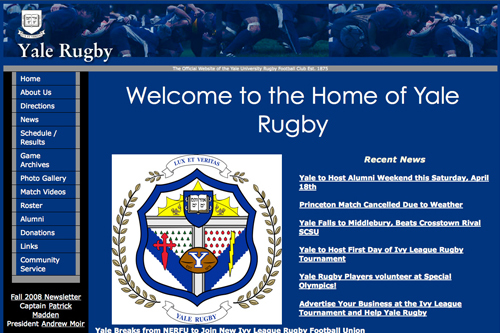 The Yale Rugby site, sponsored by features recent news on the home page and an image of their rugby crest. Sections include Roster, Match Videos and even Community Service. The Yale site current and features information on the Men's Team including About Us, Directions, News, Schedule and Results, a Photo Gallery, Match Videos, Roster, an Alumni Page (Friends of Yale Rugby), a section for Donations, Links and a nice archive of previous newsletters and game summaries. I love the Community Service page. Head coach Jan Pikul told me that the club's community service is of great importance to the team. They take it very seriously. The match videos page is a nice touch and links directly to YouTube and has a series of games from last fall. The news section lists scores, highlights and upcoming events.